The patchwork of the oat trial plots. Seed - these trials are for oat varieties on irrigation, and it is the second year this company has used our land for the trials. It is interesting to see the different growth stages of the varieties as they grow and mature. Interesting, as always. I LOVE seeing your world. Can you say that some are definitely better than others? Some look healthier to me, but maybe it is just their stage in growth that makes the difference. So glad that you are still enjoying my photos Rose. Sometimes I wonder if they are all too much the same!! After all, we only do so much on our farm, and obviously have a heavy focus on hay production. Some of the oat varieties have definitely matured quicker than others. The lighter green/whiter plot has the seed heads out whereas the dark green plots in the foreground has no seed emergence. 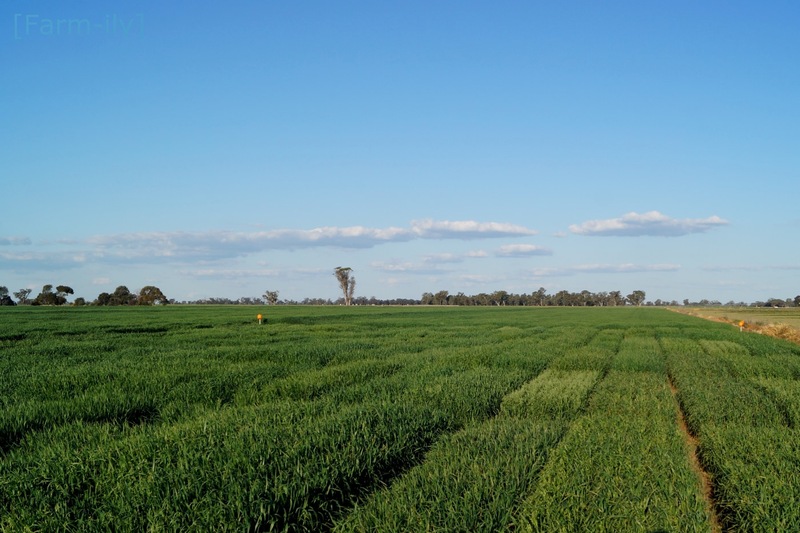 We are not privy to varieties, but some are obviously going to be more suitable for growing in areas that have a shorter season or on dryland (as opposed to irrigation). They also test for nutritional value. So some varieties when made into hay will be more suited to high producing dairy cattle, which have a different dietary requirement than the cows prior to calving. Looks so new and green! Lovely!